In classic French cooking there are the “Mother Sauces”. This refers to five sauces from which you can make all of the other “small sauces”. In other words, you can make a big vat of the mothers and then use the leftovers to make some other stuff. That’s what inspired the idea of having “Mother Dishes”. These are things you can cook that will leave you with leftover stuff to use in making other dishes. 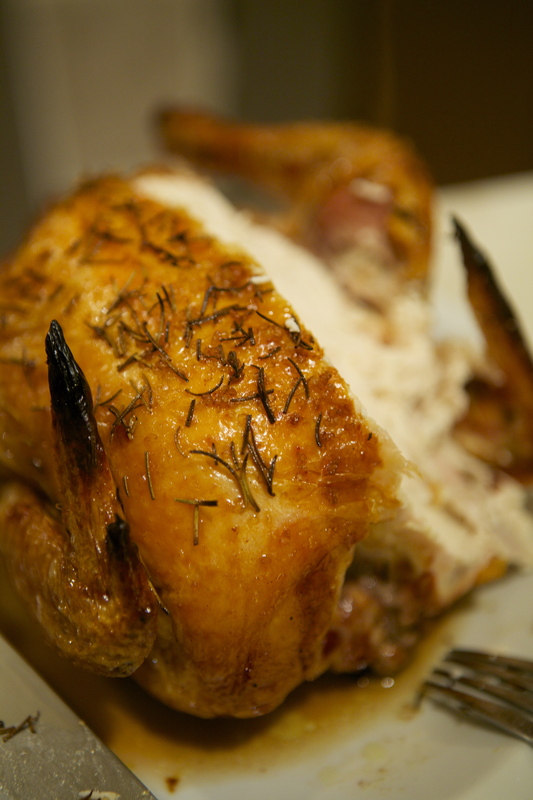 This is the first of those dishes: the roast chicken. For some reason, every time I mention that I am roasting a chicken someone gets all impressed that I’m making something so fancy. I have no idea what drugs these people are taking but I wish they would share. Aside from culinary achievements like boiling water or making ice cubes, there are few things easier than roasting a chicken. Because posting just a recipe for roasting a chicken would make me look stupid, we’ll add roasted potatoes and some sautéed spinach for a balanced meal. In point of fact, we usually have this with mashed potatoes and peas. Home economics note: I usually remove the legs and wings from the chicken before roasting it. This means you have to weigh the stuff you’ve removed and subtract that from the total original weight of the chicken to calculate the time required to roast the remaining chicken (the breasts). I then split the thighs from the drumsticks. The thighs go in one quart freezer bag and the wings and drumsticks go into another freezer bag and they all go into the freezer. Once I’ve accumulated 6 thighs (so after roasting 3 chickens) I make garlic chicken. The drumsticks and wings will end up as fried chicken, eventually. These prices are from Whole Foods on May 29, 2018. It takes me about 3 minutes to break down a chicken if I’m not removing the breasts. If you buy the parts separate, you are basically paying double to save 3 minutes of work. If that works for you, go for it. Butchers like to get paid … Personally, I’ll buy the heirloom chicken that hasn’t been overbred and yes, it does taste better. That’ll still end up about $10 less than for the non heirloom separated parts and I don’t have to throw away a bunch of plastic packaging. Roasting pan or a cooling rack and a 13×9 baking pan. So, in the case of a 4.5 lb chicken, you would cook it for 1 hour, 17 minutes, and 30 seconds in a regular oven or 1 hour, 9 minutes, and 45 seconds in a convection oven. Realistically you could just round up and go with 1 hour 20 minutes for the regular oven and 1 hour 10 minutes for the convection. That is how long you have to cook the chicken. For the potatoes: 45 minutes. Since the chicken needs to rest for 10 minutes, you subtract 35 minutes from the chicken cooking time and put them in then. For the Spinach: This should take about 10 minutes so the spinach should be cooked while the chicken is resting. Take the chicken cooking time, add 10 minutes for the chicken to rest and another 10 minutes for the oven to heat up and you have the whole time. Serves: 2 people per pound of chicken but you should plan to have leftovers, that’s the whole point! NOTE 1: When you are done with the chicken, which is to say once you have picked all the meat off and used it in pies, soups, chicken salad, sandwiches, etc., put it in a 1 gallon freezer bag and stick it in the freezer. When you have 3 carcasses you can use them to make “stock” (I use the quotes because a classic stock is not made with picked over roast chicken carcasses). Preheat oven to 450º and adjust one rack in the bottom position and one rack above with enough room for the chicken. Unwrap the chicken and TAKE THE BAG OF CHICKEN GUTS OUT OF THE CHICKEN!!! Otherwise it’s just yucky especially if the bag is plastic. Put the chicken on the rack of the roasting pan. Cut the lemon in half and stick it inside the chicken because you already removed the bag of chicken guts. This imparts a tiny bit of flavor but mostly is there to keep the chicken from drying out. Coat the chicken with olive oil and give it a little massage. Sprinkle rosemary and salt over the oily bird liberally. Smile beatifically while you wait for the oven to reach temperature. When the oven hits 450º, put the chicken in the oven. Coat them with olive oil and sprinkle with rosemary and salt. When you have 35 minutes left in the chicken cooking time, put the potatoes in on the lower rack. Ponder the meaning of life for a half hour. When the chicken is done, take it out of the oven then set the timer for 10 minutes. Put the sauté pan on the stove over medium high heat and put the butter and a splash of wine in the pan. When the butter is melted, wait another minute then put the spinach in the pan. Let the spinach wilt a bit and then stir it so that the spinach wilts evenly. When the spinach had reached the desired level of doneness, take it out of the pan and pop it in the colander in the sink to let it drain a little.